A small memorial sprang up at the corner of Southwest Sixth Street and Madison Avenue, where the body of a 34-year-old Corvallis man was found at 6:37 a.m. Friday. 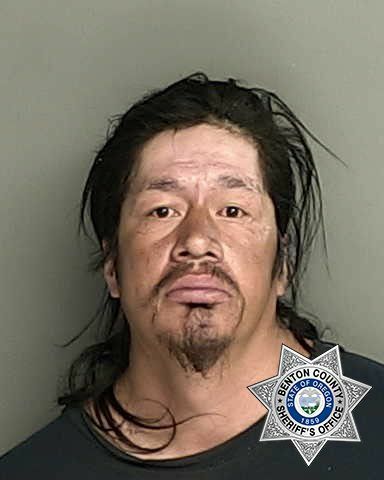 The body found in downtown Corvallis Friday morning has been identified as that of Jose Francisco Semadeni, a 34-year-old homeless man. The Corvallis Police Department and Corvallis Fire Department responded at around 6:37 a.m. Friday morning after a passerby reported finding a man’s body lying on the sidewalk in the 500 block of Northwest Madison Avenue. Lt. Jason Harvey of the Corvallis Police Department said authorities do not suspect foul play. Semadeni had been released from the Benton County Jail Friday morning, Harvey said. He was arrested at around 2:20 p.m. Thursday on a charge of second-degree criminal trespassing. According to a report from the Corvallis Police Department, Semadeni was contacted by an officer in Riverfront Commemorative Park near Southwest First Street and Adams Avenue. Officers recognized that Semadeni had previously been trespassed from city parks until May 28 and took him into custody. Officers at the scene reportedly received a medical clearance report from Good Samaritan Regional Medical Center following the arrest, and Semadeni was booked into the jail. Jail representatives referred all questions in the case to Benton County Sheriff Scott Jackson. Jackson was not available for comment on Friday. Kevin Weaver, outreach coordinator at First Christian Church near the site where Semadeni’s body was found, said Semadeni had been homeless in Corvallis for several years. Semadeni had previous medical issues, said Aleita Hass-Holcombe, president of the Corvallis Daytime Drop-In Center. Volunteers contacting his family years prior had been told that Semadeni was adopted from Colombia and had moved to Corvallis more than 15 years ago, Hass-Holcombe said. New adoptables in Corvallis. Pick your new dog or cat!